Lee Barsby of Peterborough Northern Star (stripes) in action against Harborough Town. Photo: Chantelle McDonald. @cmcdphotos. 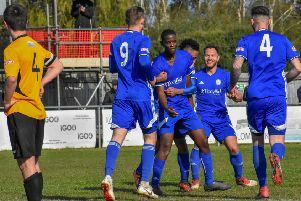 Deeping Rangers are within touching distance of top spot in the United Counties Premier Division after thrashing Sileby Rangers 6-0 at the Haydon Whittam Stadium yesterday (October 28). Recent signing Kaine Felix and Jason Kilbride both scored twice with Scott Coupland and Charlie Coulson also on target as Deeping ran riot. Peterborough Northern Star's Jake Sansby (right) battles for possession in the defeat by Harborough. Photo: Chantelle McDonald. @cmcdphotos. Felix is a star capture by Deeping. He’s played for both York City and Boston United at National North League level recently. Michael Goode’s men are now fourth, seven points behind leaders Leicester Nirvana, but with two games in hand. Nirvana lost for the first time this season yesterday at ON Chenecks. Wisbech made it 10 matches unbeaten with a comfortable 3-0 win at St Andrews. Billy Smith’s penalty and an Alex Beck goal saw the Fenmen 2-0 up in 25 minutes before Michael Frew completed the scoring in the final moments. But there was disappointment for Yaxley and Peterborough Northern Star who were both beaten at home. Dan Cotton scored the Cuckoos’ consolation goal, while 10-man Star conceded twice in the final seven minutes to Harborough Town. Jamar Dobson (stripes) in action for Peterborough Northern Star against Harborough at the weekend. Photo: Chantelle McDonald. @cmcdphotos. The city side can feel harshly done by as central defender Matt Cox wes sent off on 35 minutes after picking up a second yellow card while conceding a penalty. Goalkeeper Ross Ingram saved the spot-kick and when Jamar Dobson fired Star in front 20 minutes from time an unlikely victory was on the cards until the visitors inflicted late heartbreak. Pinchbeck are up to second after a 3-1 home success over Irchester. An own goal kept Pinchbeck on level terms at the break before fine strikes from Tyler Wright and Liam Ogden in the final 20 minutes secured the points. Liam Harrold, Dan French and an own goal delivered three points for fifth-placed Blackstones from a 3-2 win over Potton. Former Posh player French popped in his goal from 25 yards. Bourne had their game sewn up in the opening 35 minutes as goals from Richard Nelson and Eddie McDonald and a Jezz Goldson-Williams penalty established a 3-0 lead at Thrapston which the Wakes maintained until the end despite a late red card for Gav Cooke. Holbeach United booked a quarter-final date with lower level Harrowby after a 6-0 UCL Cup win at Division One high fliers Buckingham Town. Mitch Griffiths and Joe Smith scored two apiece for the Tigers. Premier Division: Deeping Rangers 6 (Felix 2, Kilbride 2, Coulson, Coupland), Northampton Sileby Rangers 0; Peterborough Northern Star 1 (Dobson), Harborough Town 2; St Andrews 0, Wisbech Town 3 (Smith, Back, Frew); Yaxley 1 (Cotton), Kirby Muxloe 3. Division One: Blackstones 3 (French, Harrold, og), Potton United 2; Lutterworth Town 2, Huntingdon Town 0; Pinchbeck United 3 (Wright, Ogden, og), Irchester United 1; Thrapston Town 0, Bourne Town 3 (Nelson, Goldson-Williams, McDonald). League Cup: Buckingham Town 0, Holbeach United 6 (Griffiths 2, Smith 2, Zuerner, Gow).